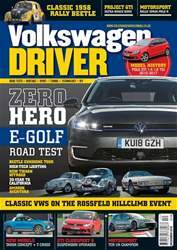 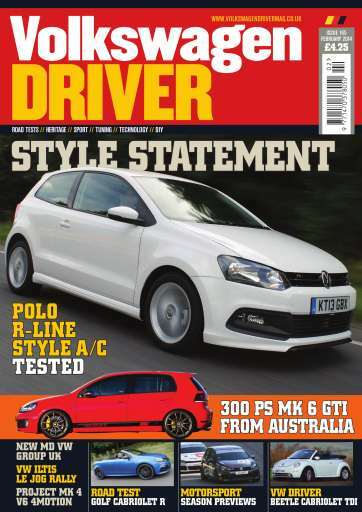 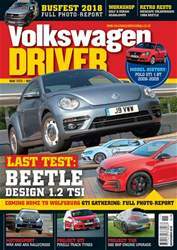 New MD for Volkswagen Group UK, New Passat Exclusive and Style, Road test: Polo R-Line Style A/C (60 PS 1.2), Motorsport: APR VW Racing Cup and BTCC 2014 previews, VW Iltis on Le Jog, Road test: Golf Cabriolet R, Stephen Hardy’s Beetle Cabrio TDI, Laura Vukman’s Polo GTI and modified Mk 6 GTI, Mk 4 Golf V6 4Motion Eibach suspension upgrade, Ian Clark’s Mk 6 Golf Match 2.0 TDI, DPF dilemma, 7-speed DSG oil-change, Tyre ageing? 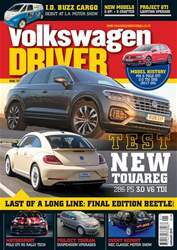 Autoeuropa plant, New Skoda Yeti. Products & Services: Milltek Cerakote tailpipe coating, Viper oil catch cans, Forge Motorsport coolant hose kit for Golf 7 GTI, Codeclean luxury concours wax, Outdoor Revolution drive-away awnings, Pipercross Evo 2 cold-air intake system, Eibach Pro-Street 5 for Mk 5 Golf R32 + Mk 6 Golf R, AmD Milltek exhaust and re-map for Golf 7 GTI, Hosetechnik stainless-steel brake fittings, Forge Motorsport DV for 1.4, 1.8 and 2.0 TSI engines, Gaz adjustable dampers for Mk 4 Golf, Laser Tools tyre access extension valve.